Second only to (duh) nachos, breakfast/brunch is one of our most favorite food groups (as you may have guessed, we aren’t exactly strict adherents to the US FDA nutrition guidelines…). We have long aspired to combine these two great loves into one mythical dish, the breakfast nachos (also possibly known as breakchos, brachos, nachfast, and/or fastchos). The Friendly Toast has something resembling breakfast nachos on their menu, which we have been eyeing for some time, but are always tempted away by other items on their delicious menu. On vacation in Lenox, MA (Official Motto: Are you a rich middle aged woman? Then you’ll love it here! ), we had practically given up hope on finding nachos amongst the bevy of overpriced Italian restaurants and wine bars. Then serendipity struck at Spoon, a cute little breakfast/lunch/ice cream cafe in the heart of town. 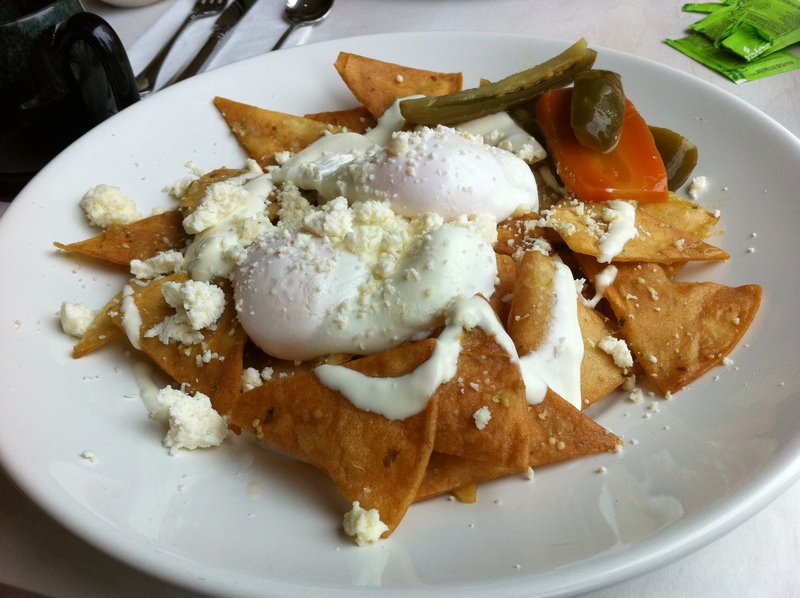 Our bleary eyes widened in surprise and delight at the description of Chilaquiles on their menu: “Basically, nachos with eggs. 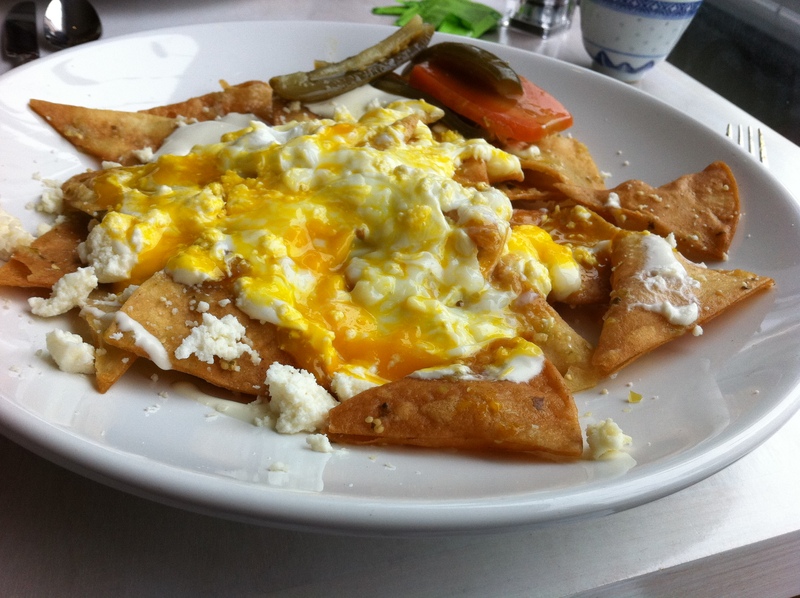 Salsa verde, queso fresco, crema, jalapeno.” Nachos AND breakfast? Sign us up! Aren’t those egg yolks just begging to be popped?? Appearance: (7) We found these to be much less colorful than the description. But it turned out that the salsa verde and crema had been combine into one. +1 for excellent use of garnish. Quality of Ingredients: (10) The chips were thick and hearty, almost like pita chips, and definitely homemade. The crema/salsa verde combination was at once spicy, tangy, smooth and creamy– and the queso fresco added a nice salty kick. The poached eggs were a little on the runny side (perhaps their only fault, and it can be a personal preference). We loved the clearly house-made pickled jalapenos and carrots on the side– definitely a nacho patrol first! Distribution of Toppings: (8) We could have used a little more of the chili/crema concoction, as it was sad to get a chip without. Other than that, the distribution is up to the user: how early do you break the eggs? A warning, once you do break the yolks you need to eat fast– runny egg soaks into a chip far faster than most nacho ingredients. Price: (9) At $9, these were a hearty and original breakfast dish, something that is often hard to come by, especially in tourist traps such as this! Overall: 34/40. Other breakfast nachos, if you’re out there, take notice and get your game face on. These were simple, fresh, authentic tasting, memorable nachos that we would re-eat in a heartbeat. We wonder, will they ever be topped? Tags: Berkshires, breakfast, old people, Specialty nachos, Tanglewood, tourist traps, Viva Mexico! ← Temple Bar Cafe (Klovenierburgswal Centrum, Amsterdam): AmsterDAM, these nachos are terrible! Chilaquiles are my absolute most favorite breakfast food.There are only a handful of places in Boston that do them, but it’s still difficult to find them done well. To Lenox I go!